Gold futures declined for the first time in eight sessions, slipping from a 17-month high, but still advanced for their third straight weekly gain. Gold for August delivery on Friday shed $3.60, or 0.3%, to settle at $1,294.80 an ounce on the Comex division of the New York Mercantile Exchange. On Thursday, the yellow metal closed at its highest price since Jan. 22, 2015. "Gold is reverting to its safe-haven role, in a situation where euro zone government bonds are in negative yield territory and investors have fewer safe assets to choose from," Reuters quoted Mitsubishi Corp strategist Jonathan Butler. Gold futures gained 1.5% this week after rising 2.7% last week and 2.2% the week before then. They are $234.60, or 22.1%, higher than their ending settlement in 2015 at $1,060.20 an ounce. "Twenty-three analysts and traders took part in a survey of market professionals. Fifteen, or 65%, said they were bullish. The bearish and neutral camps both received four votes, or 17%. Meanwhile, this week’s Kitco’s online survey received 852 votes. A total of 683 respondents, or 80%, said they were bullish for the week ahead, while 115, or 13%, were bearish. The neutral votes totaled 54, or 6%." Elsewhere in trading Friday, silver for July delivery fell 19.6 cents, or 1.1%, to close at $17.411 an ounce. In the prior session, silver futures settled at their best level since May 2. The loss on Friday trimmed silver’s weekly advance to 0.5%. 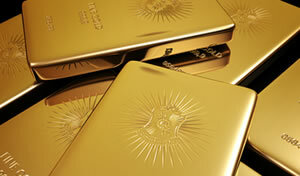 The precious metal is 26.1% higher so far this year. July platinum declined $12.20, or 1.3%, to $966.10 an ounce, for a 2.8% weekly loss. Palladium for September delivery shed $5.30, or 1%, to $529.65 an ounce, falling 3% on the week. Year to date, platinum is 8.2% higher while palladium is 5.8% lower. Gold fell $20.05, or 1.5%, to $1,290.70 an ounce. Silver declined 34 cents, or 1.9%, to $17.37 an ounce. Platinum fell $17, or 1.7%, to $968 an ounce. Palladium declined $9, or 1.7%, to $531 an ounce. For the week, gold rose 1.2% and silver edged up 0.3% while platinum dropped 2.8% and palladium plunged 4.2%. Gold coin sales advanced 19,500 ounces this week after rising by 18,000 ounces last week. The weekly splits include 16,500 ounces in American Gold Eagles compared to 15,000 ounces previously, and 3,000 ounces in American Gold Buffalos to match the previous week. Silver coin sales advanced 474,000 ounces this week after rising by 1,008,500 ounces last week. Sales splits include 468,000 ounces in American Silver Eagles compared to 843,500 previously and 6,000 ounces in Harpers Ferry Five Ounce Silver Coins compared to 165,000 ounces previously. The U.S. Mint restricted this week’s sales of American Silver Eagle to 1,672,500 coins. Bullion distributors ordered 28% of them. 2016 American Silver Eagles are running at a record pace with sales of 24,795,500 coins, representing a 27.84% increase over those sold through same time in record-breaking year 2015. I saw pics 3 days ago taken at the West Point Mint of the 2016-W Proof American Liberty high relief silver medals & they look great! The Mint at San Francisco is also striking the Proof high relief silver medals now. They are 1-ounce of .999 fine silver struck on the same blank planchets used for the silver American Eagle coins. But the Mint in typical fashion hasn’t released a sale date, mintage limit, household limits or price yet! The ASE $1 bullion coin sales are officially dead in the water! Worst sales week all year with only 28 percent sold & over 1.2 million coins left on the table unsold to the US Mint’s 13 worldwide bullion coin Authorized Purchasers. Amazing! The marketplace is vastly oversaturated with these common coins. Does anyone think this will be a record year after 47 million were sold last year? Or is this just the typical “Summer doldrums” while many people are on vacation & not buying coins? You are so right! The US Mint’s 13 worldwide bullion coin Authorized Purchasers are each given an allocation based on how many of each coin type they purchase when coins are rationed. If they don’t buy now, they don’t get as many as they may need later. “Forced buying” by the Mint when there is NO shortage of ASE planchets now with more than 2.2 million available this week 6-20 & the APs haven’t purchased the total available in any given week for awhile now. Crazy situation for sure!